Two leading figures in the Island’s finance sector have received life membership of the Chartered Institute for Securities & Investment in recognition of 55 years in stockbroking. Ramsey Crookall & Co. Chairman Neal Crookall and Dursley Stott, a consultant to Ramsey Crookall, received the CISI life membership in acknowledgement of their long-standing membership of the organisation and distinguished careers. The CISI is the largest professional body for people who work in the securities and investment industry in the UK and major financial centres around the world. Formed in 1992 by London Stock Exchange practitioners, it has more than 40,000 members in 110 countries. It organises a range of professional and social activities, from continuing professional development seminars to prestigious conferences, as well as providing vocational qualifications. Dursley Stott and Neal Crookall. 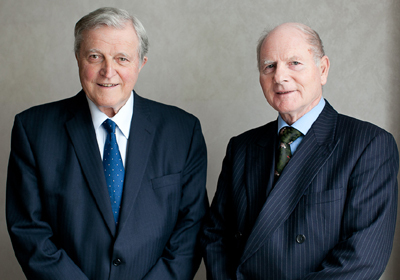 Mr Crookall began his stockbroking career when he joined his father’s firm in 1959. During the 1960s he gained invaluable experience working the floor of the Exchange in London before being appointed Senior Partner at Ramsey Crookall in 1974. He remained in that position until 2009 and now holds the role of Executive Chairman. In March 2013 Mr Crookall was presented with the Lifetime Achievement Award for services to the Industry at the City of London Wealth Management Awards. He said: ‘I have been fortunate enough to have enjoyed a challenging and varied career in this profession over the past 55 years and am delighted to have been acknowledged by my peers. Mr Stott is a well-known figure in roles such as Honorary President of the Isle of Man Commonwealth Games Association and past President of the Isle of Man Red Cross, but is also a highly regarded figure in the Island’s finance sector. He has played a major role in the development of the sector, and is credited with being the founder of the local unit trust industry. He entered the profession in 1959 after returning to the Island from National Service and university, joining the family firm R.L. Stott. He also worked in the City of London in the early 1960s and was appointed Partner in the family firm in 1962. Following the sale of the business in 1986, Mr Stott continued as a Senior Partner for three years and Consultant for two years. He went on to work for a variety of investment and broker firms and is currently a Consultant with Ramsey Crookall.